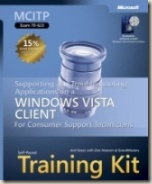 This book is designed for Consumer Support Technicians (CSTs) who are responsible for configuring, managing, and troubleshooting Windows Vista for home and small business users. The book covers all of the exam objectives for Microsoft Exam 70-623: Supporting and Troubleshooting Applications on a Windows Vista Client for Consumer Support Technicians. Passing that exam will make you a Microsoft Certified IT Professional. If you have been thinking about getting more involved in IT and you want to prove your skills, this is a great exam to start with. The book and companion CD includes hundreds of practice questions that will help you prepare for the exam. There’s also an included coupon to help save you money on the exam. More details about the book are available from the Microsoft Press Training Kit site.